Marawa holds the world record for 200 hoops at once. 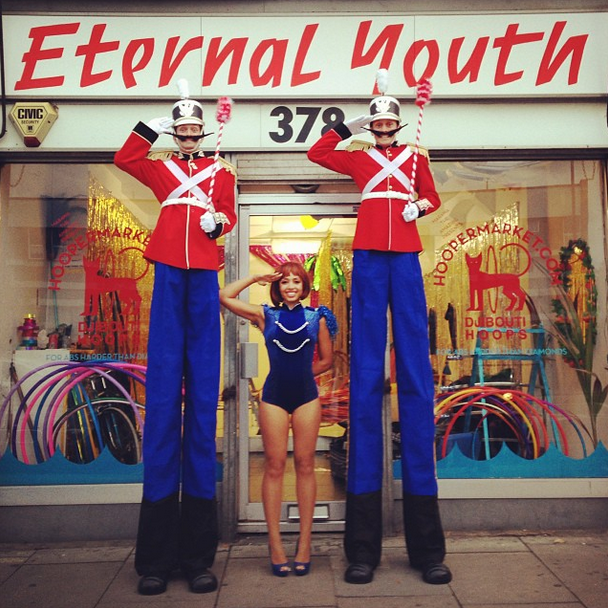 She has performed with Kenzo, JackÜ, Refinery29 and hula hoop crisps. She has 4 pairs of high heeled roller skates. She played Josephine Baker in New York for 6 months to rave reviews. She came 3rd on Arab's Got Talent and was a semi finalist on BGT, AGT. Marawa holds 12 world records. Here are some facts for you! My Father is Somali and my Mother is Australian. As a child I lived in Australia, Papua New Guinea and the Middle East. We never stopped travelling. My childhood hero was (and forever will be) Olga Korbut. She was a gymnast who’s raw emotions, originality and huge smiles wowed the judges and won her medals and fans everywhere. Such a huge inspiration. I saw Starlight Express when I was 8 and for the next 10 years dreamt of playing the character ‘Pearl’ from the rollerskating musical. Delores Van Cartier (from Sister Act), Josephine Baker, Esther Williams, Tandi Iman Dupree and Perez Prado are all LEGENDS I look up to. I played drums all through high school (strictly James Brown classics) and music was my life. After graduating I went on a tour of circus schools in China which blew my mind. 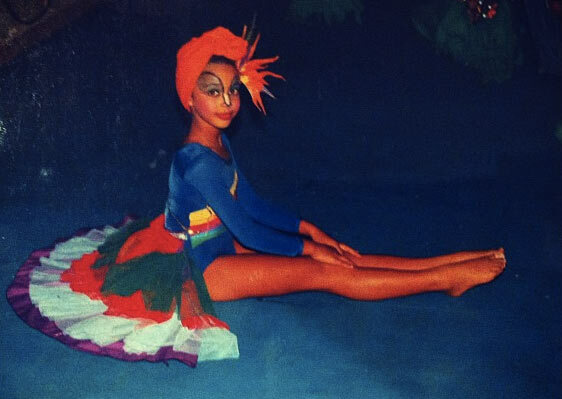 Running away with the circus had also become a legit degree and so I enrolled in a Bachelor of Circus Arts—which I didn't get into - but it seemed like the only degree that made sense to me - so I reapplied the next year and thankfully they let me in. I trained in a range of circus skills at NICA, specialising in Swinging Trapeze, but I knew my future was with hoops—super portable, super fun and anyone could get involved, any age, anywhere in the world with just a little bit of practice. Spinning out for Kenzo's Vogue Fashion Night Out in Paris. I love working with creative people to make videos and live performances. 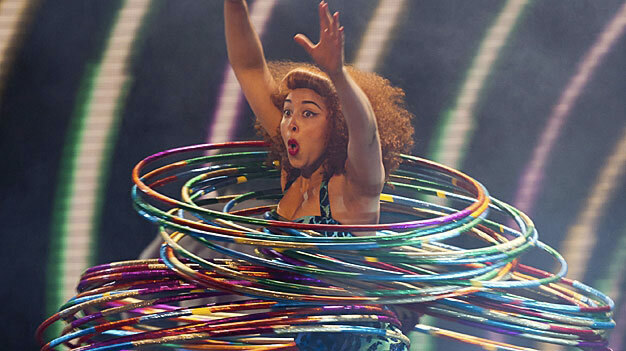 Fashion brands book me to incorporate fun and hoops into their shows and events, which I love too. I’ve also curated my own events at fashion weeks in London and Paris. Will someone please tell Mr Louboutin - who I know loves trapeze - that we should do something together? 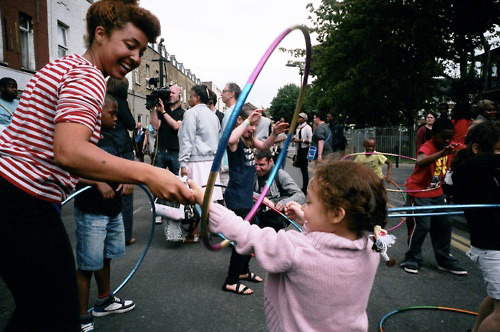 Hooping in Hackney after the London Riots. Bringing the fun back! Through a series of workshops in 2012 Marawa’s Majorettes was launched, a glittering team of adorable hoop performers that amazed crowds just like me and also teach! An army of Hoopers yeah ! Check out the Majorette’s page if you’d like to get involved. I love teaching. I love performing. I love working on interesting projects. Most of all I LOVE making new friends all over the world. My postcard game is epic. If you’d like to work with me, see Bookings, if you’re interested in learning to hoop or hosting an event, see Workshops and get over to The Hoopermarket. I’m always keen to connect on Tumblr, Twitter, Facebook, and the rest of it, so get in touch already! Conquer the world with hoops!